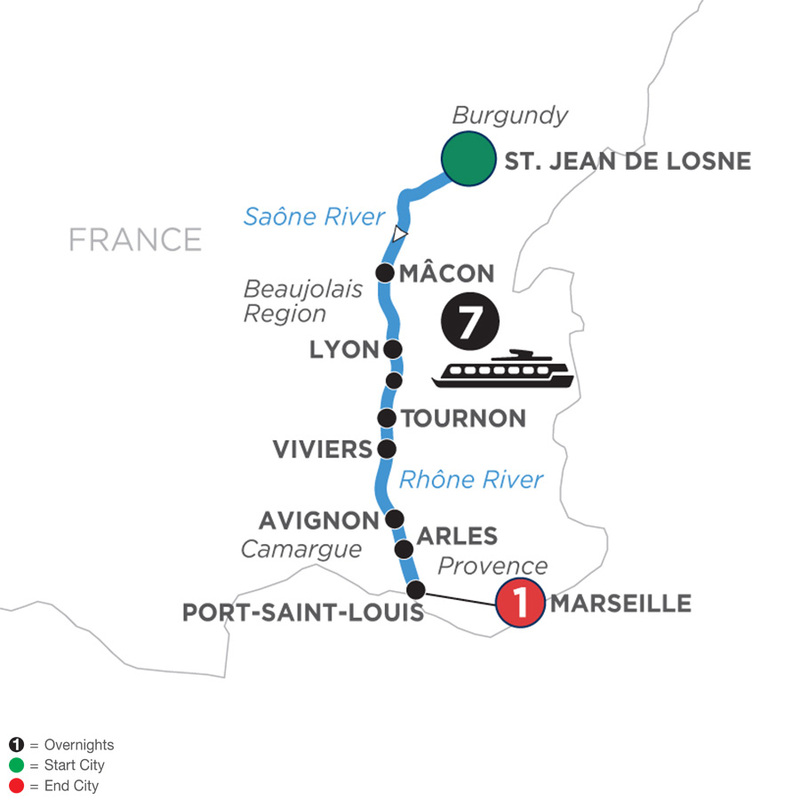 Whether you're a weekend sipper or a wannabe sommelier, why not take a cruise where winding rivers and world-class wines flow? 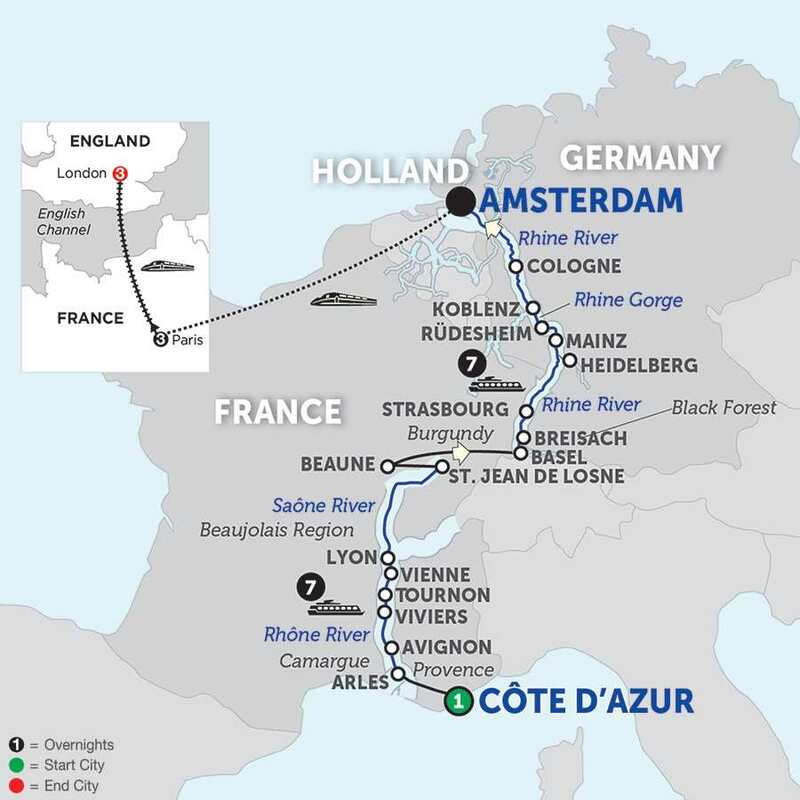 On an Avalon wine appreciation cruise, vino lovers of the world unite with the world’s most renowned winemakers and wine masters. 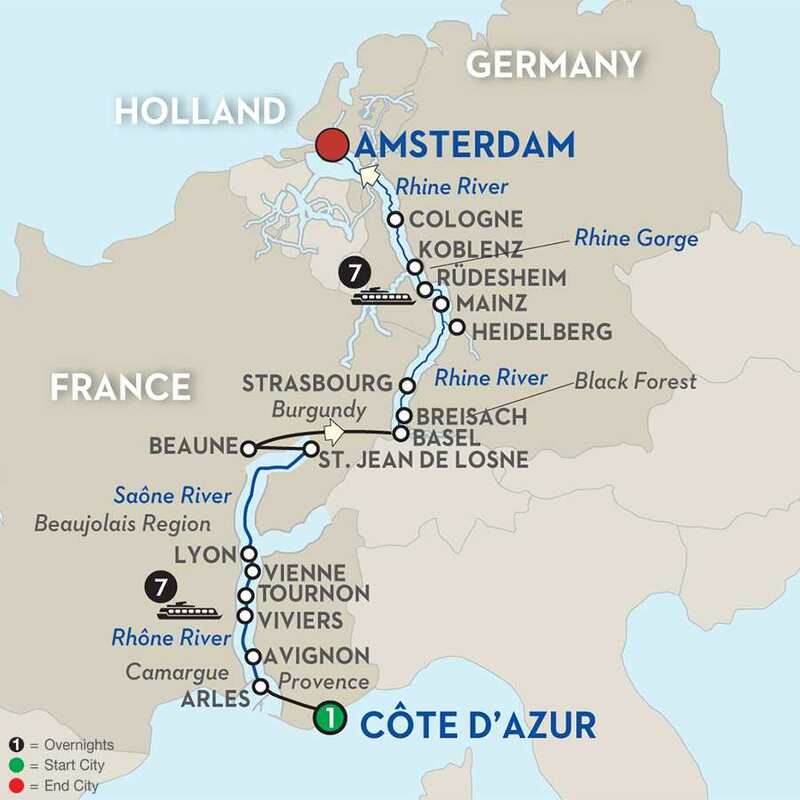 Sniff, swirl, and sip your way past the rolling vineyards of Europe as a certified Master of Wine-the most respected title in the wine industry-gives new meaning to the phrase "wine and dine." 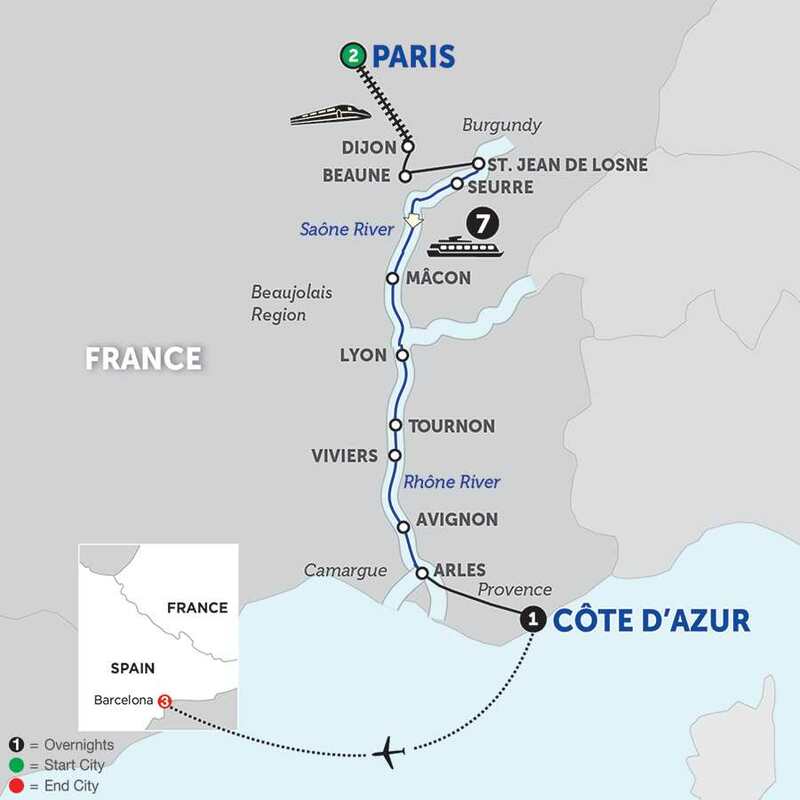 On board you’ll learn the perfect pairings for every delicacy from cheese to chocolate, while on land you’ll walk along the hallowed halls of the ancient cellars of wine masters, makers, and merchants. 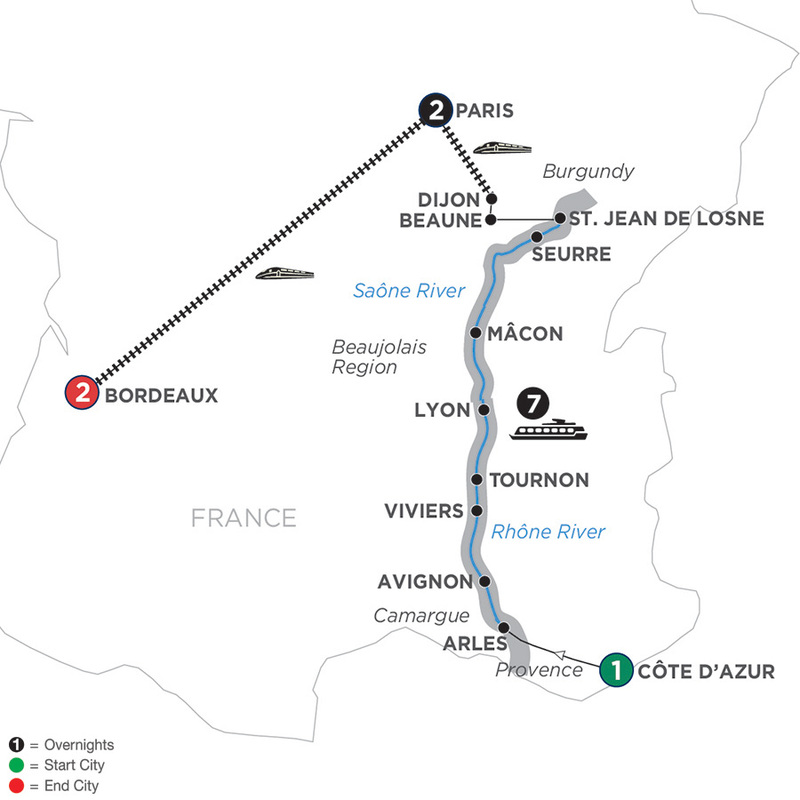 Along the Danube, Rhône, and Saône, we’ll introduce you to the history-rich hillsides and the even richer reds, whites, and rosés they produce. 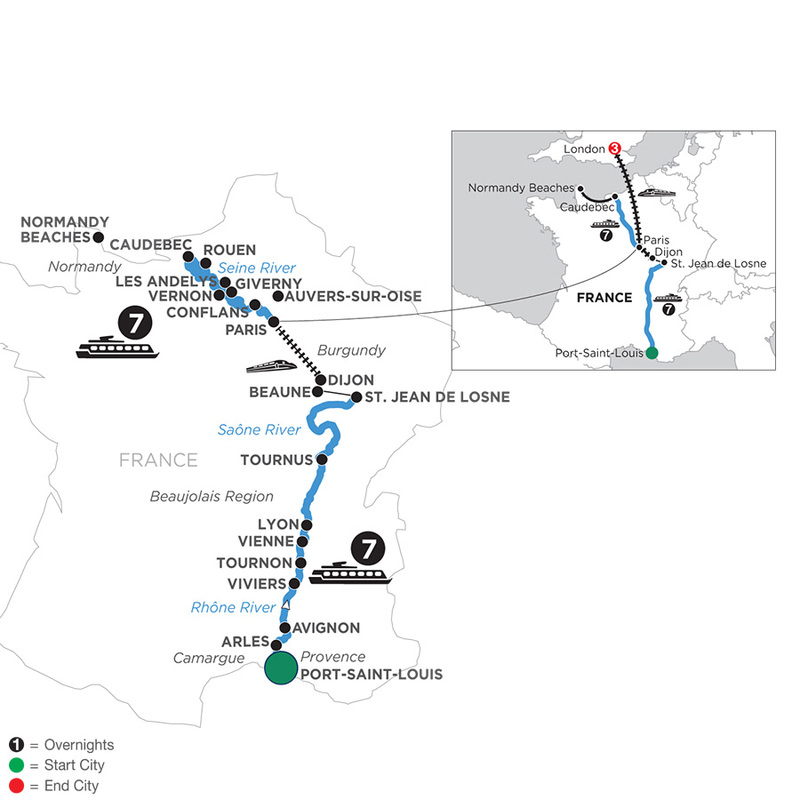 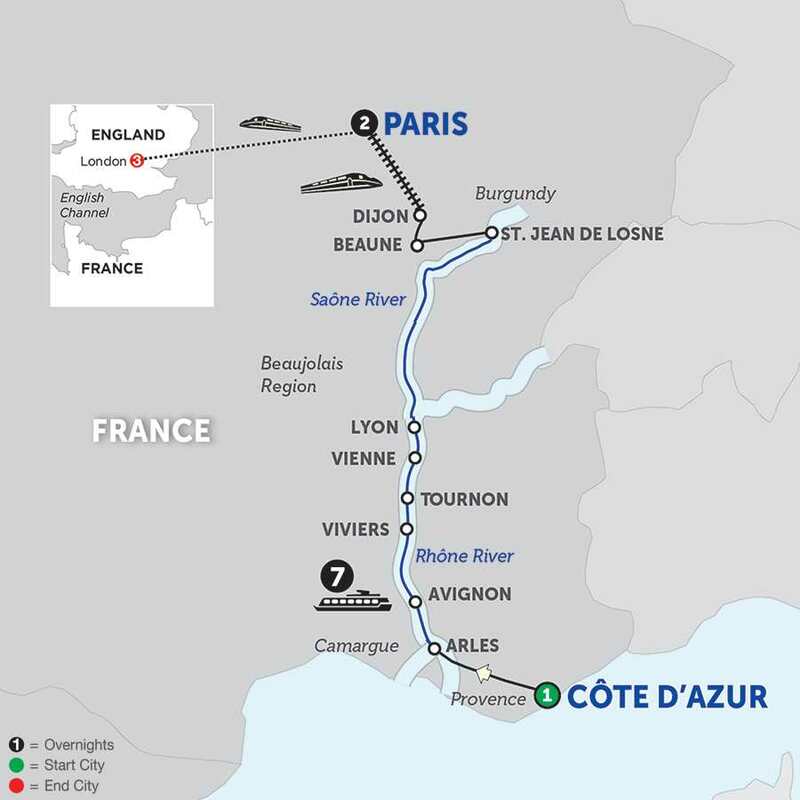 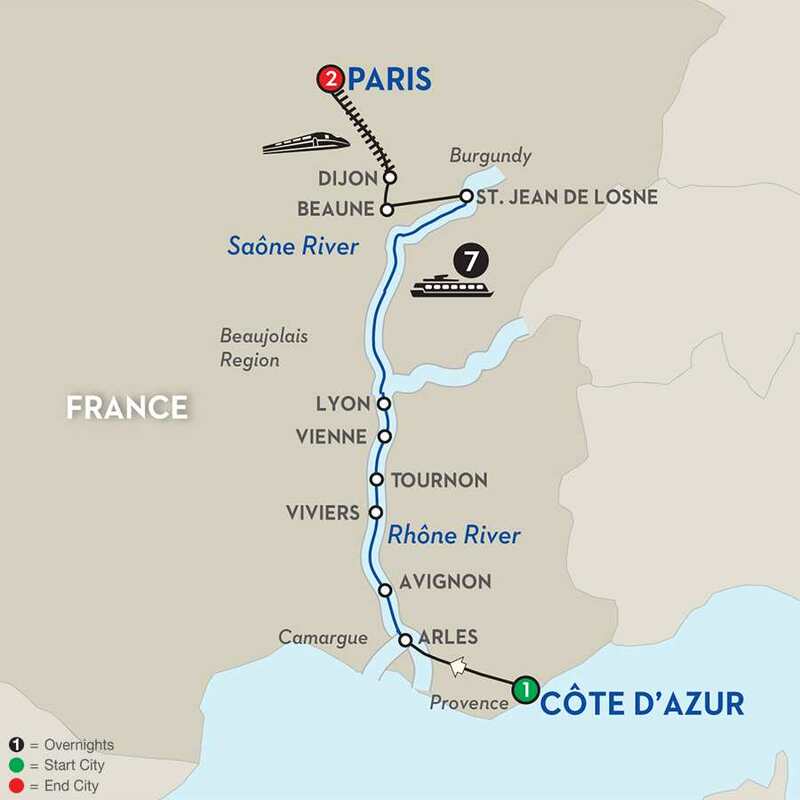 Take a wondrous journey through beautiful France along the Rhône and Saône Rivers with guided sightseeing in the well-known French treasures and some hidden gems, including a London vacation to complete your trip in style. 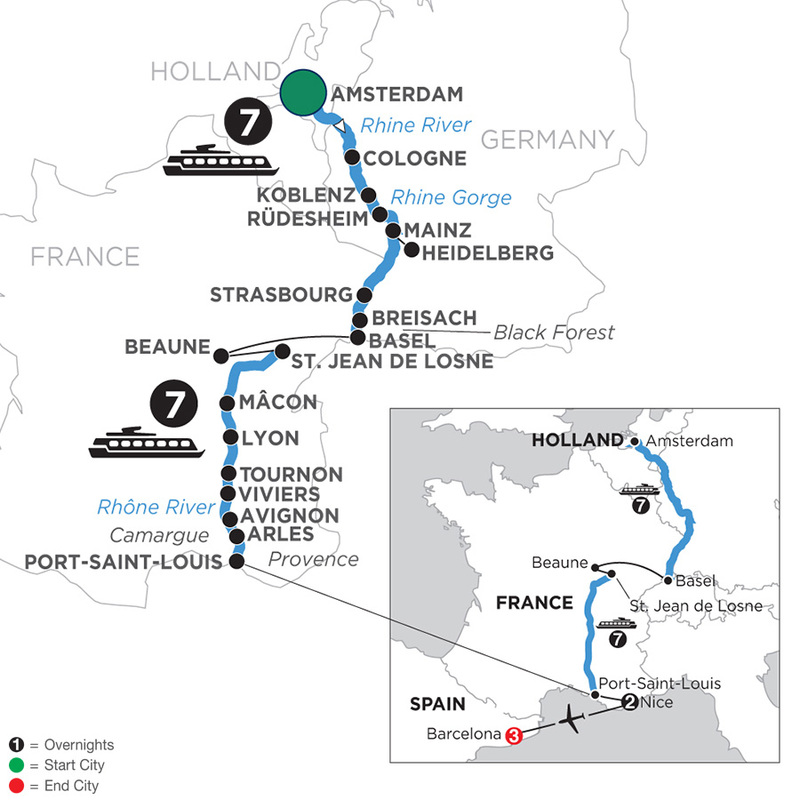 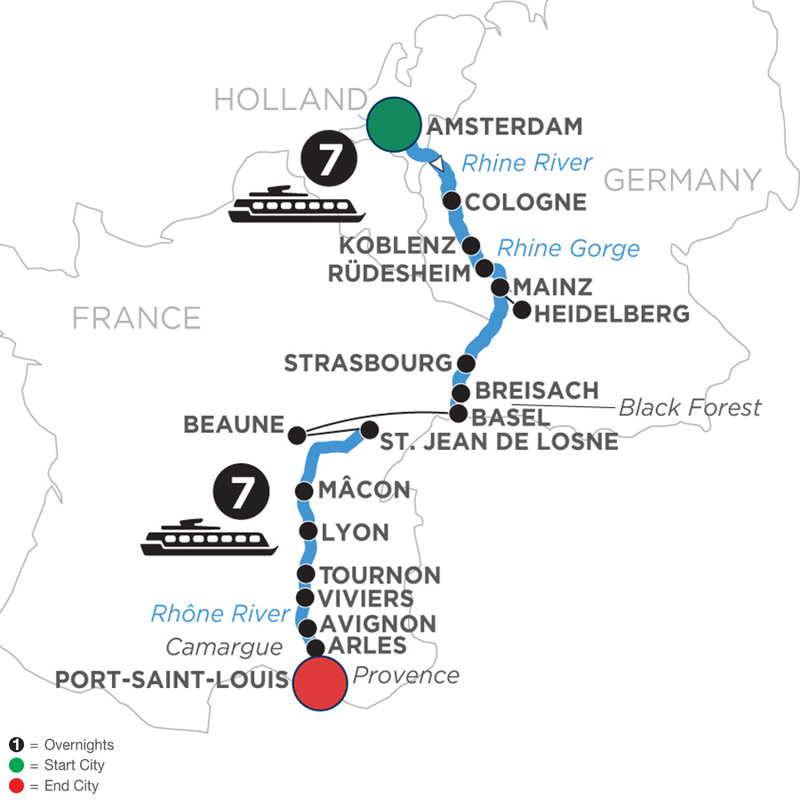 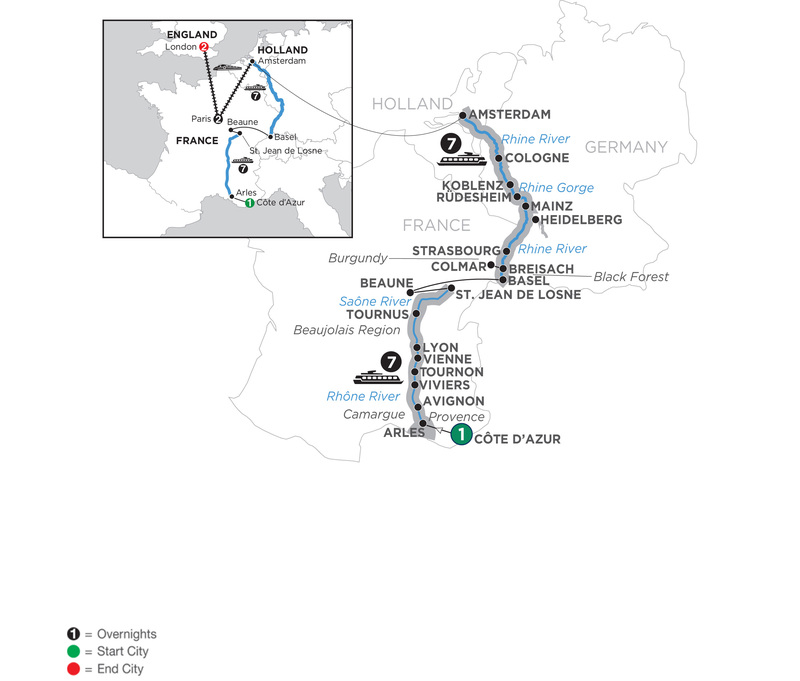 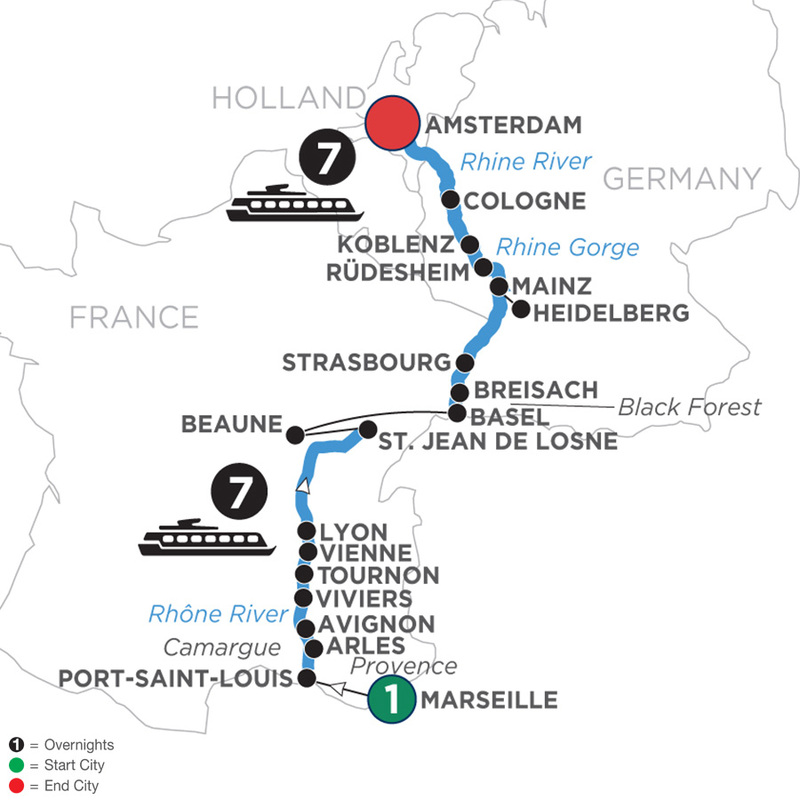 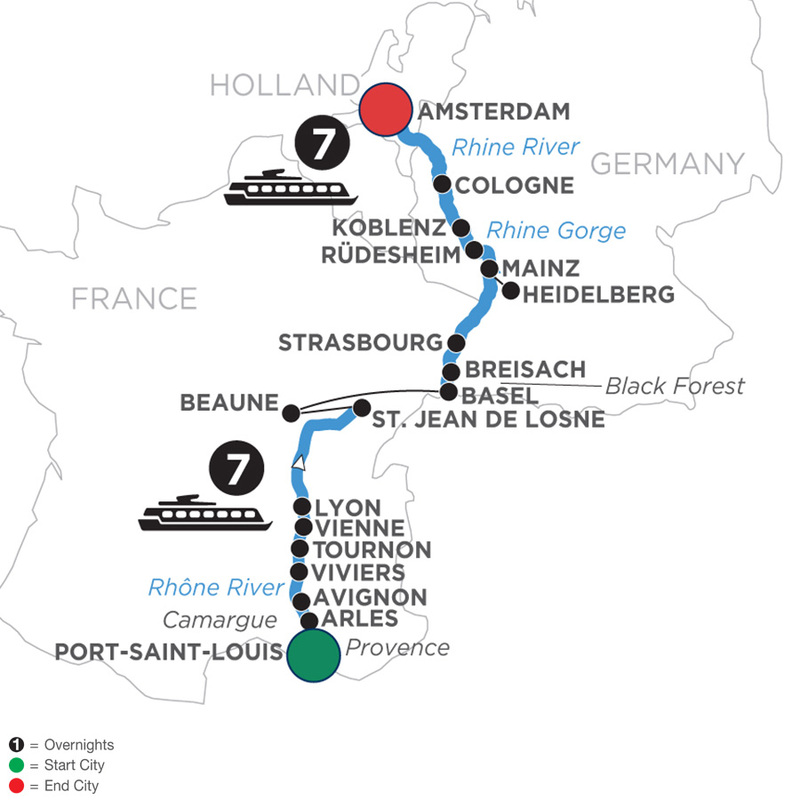 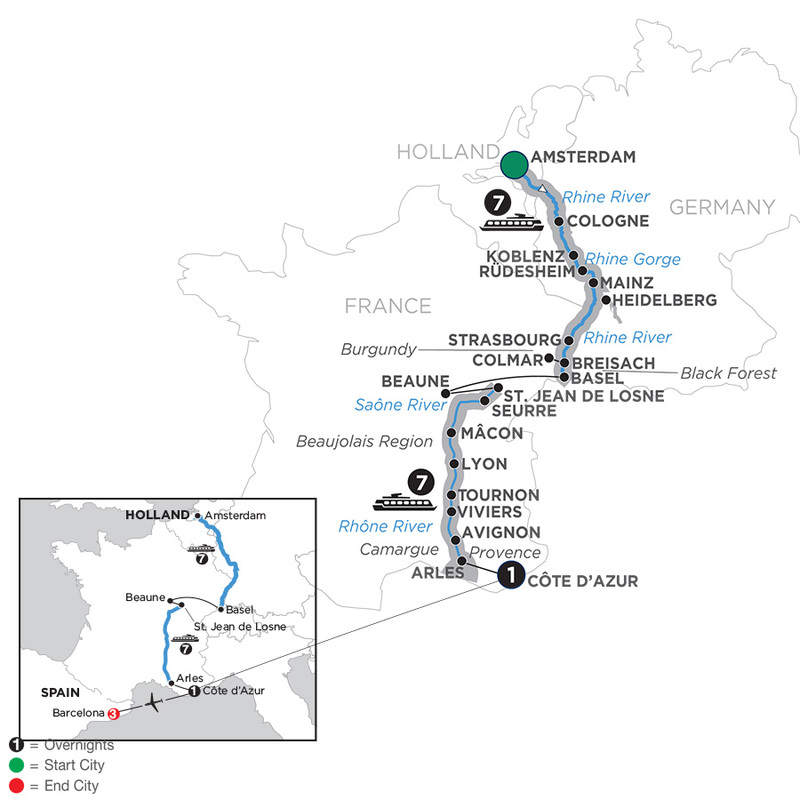 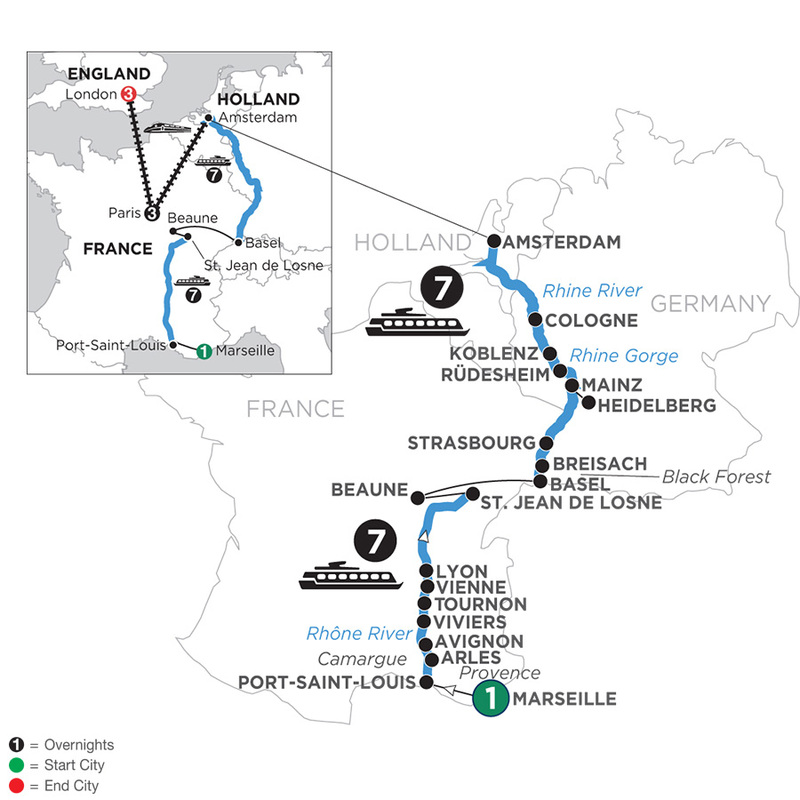 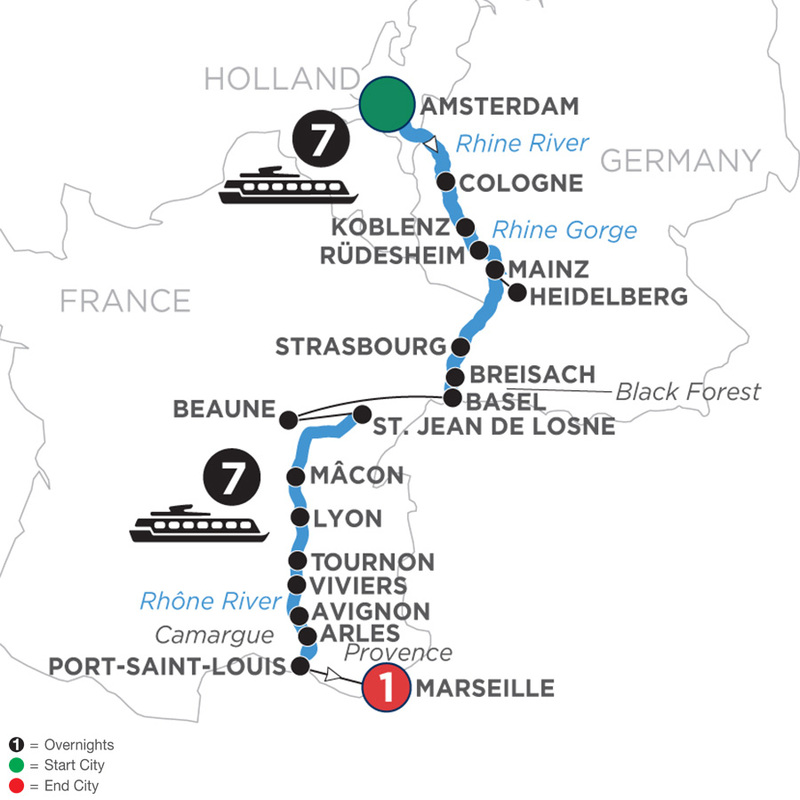 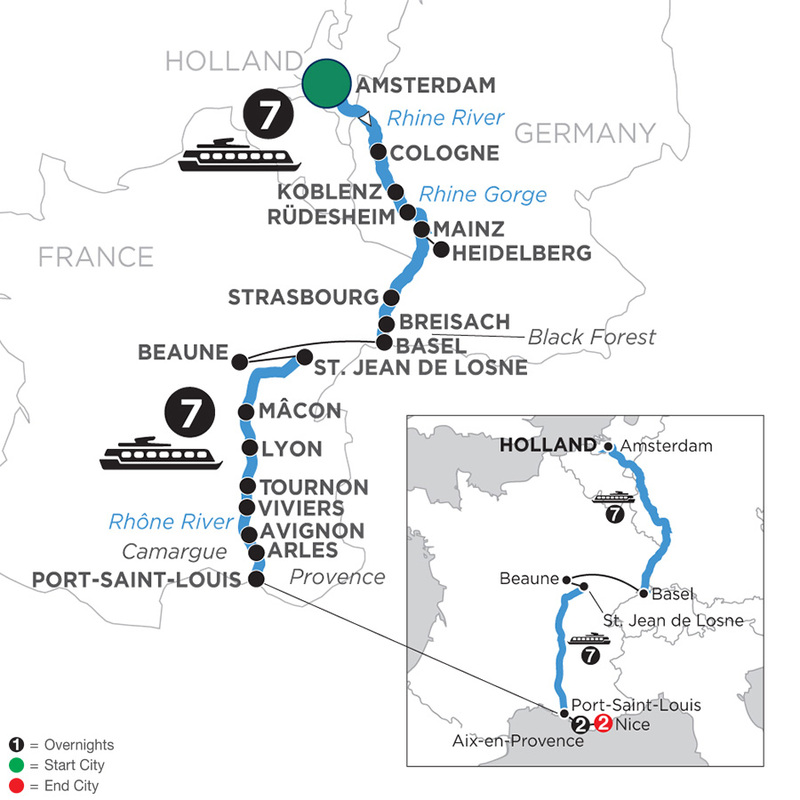 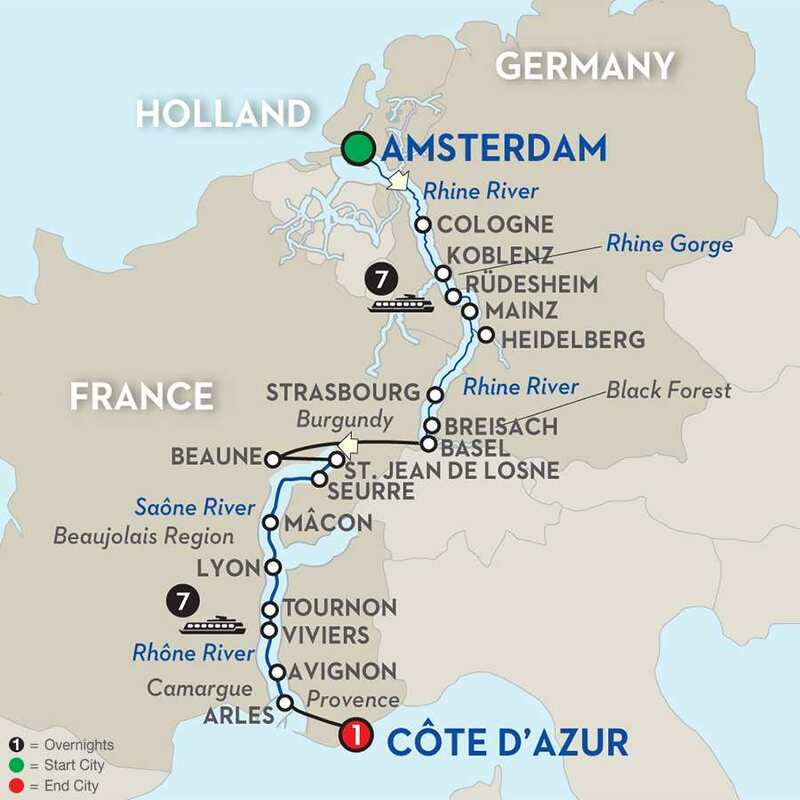 Immerse yourself in French and German culture on this fabulous European river cruise vacation along the Rhône, Saône, and Rhine Rivers. 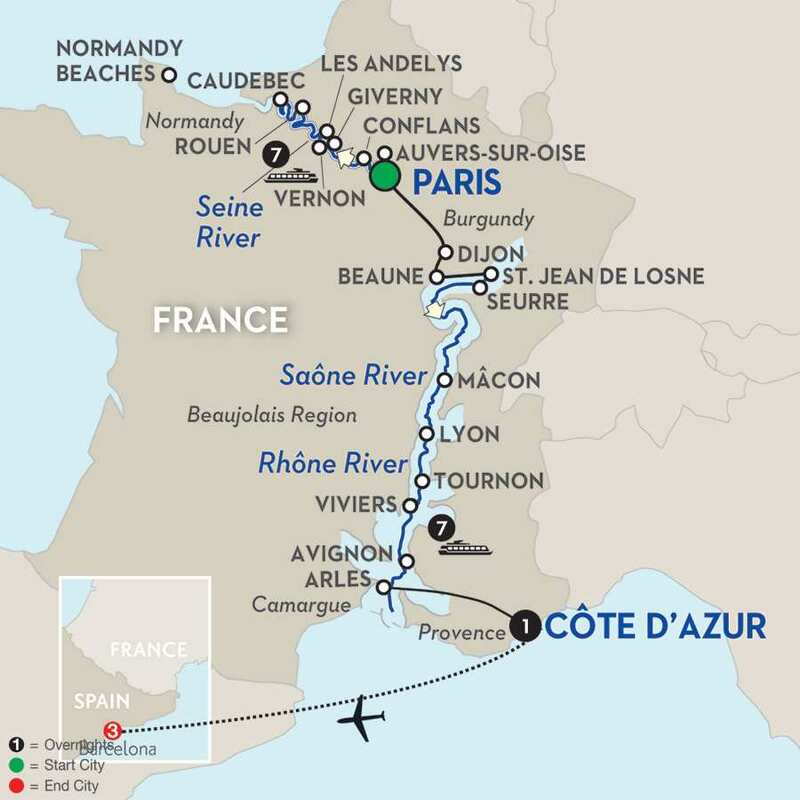 Begin your adventure on the captivating French Riviera, also known as the Côte d’Azur. 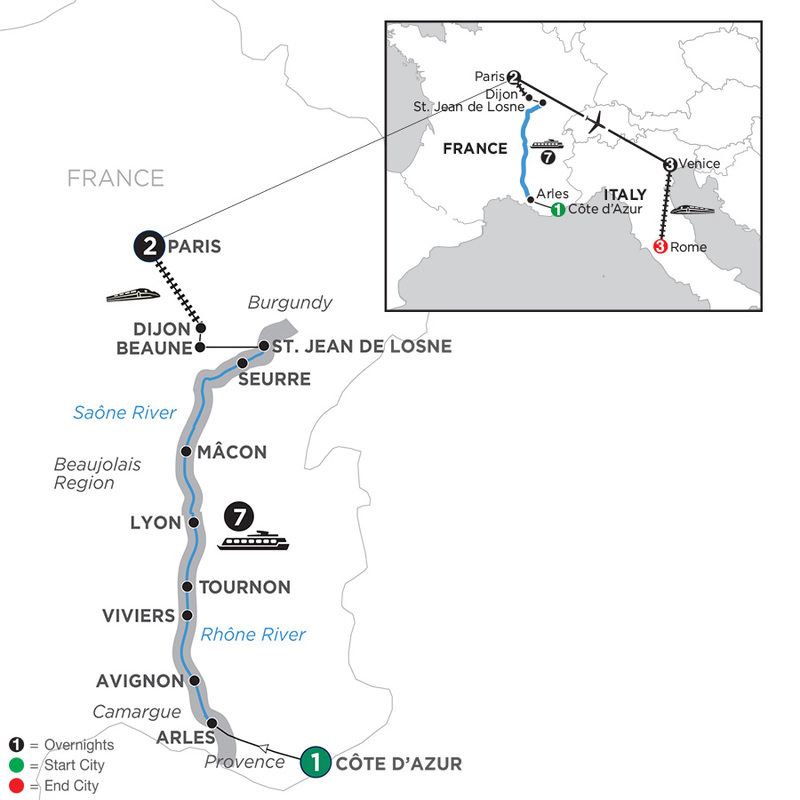 Explore this elegant area and relax along the remarkably blue water of the Mediterranean Sea. 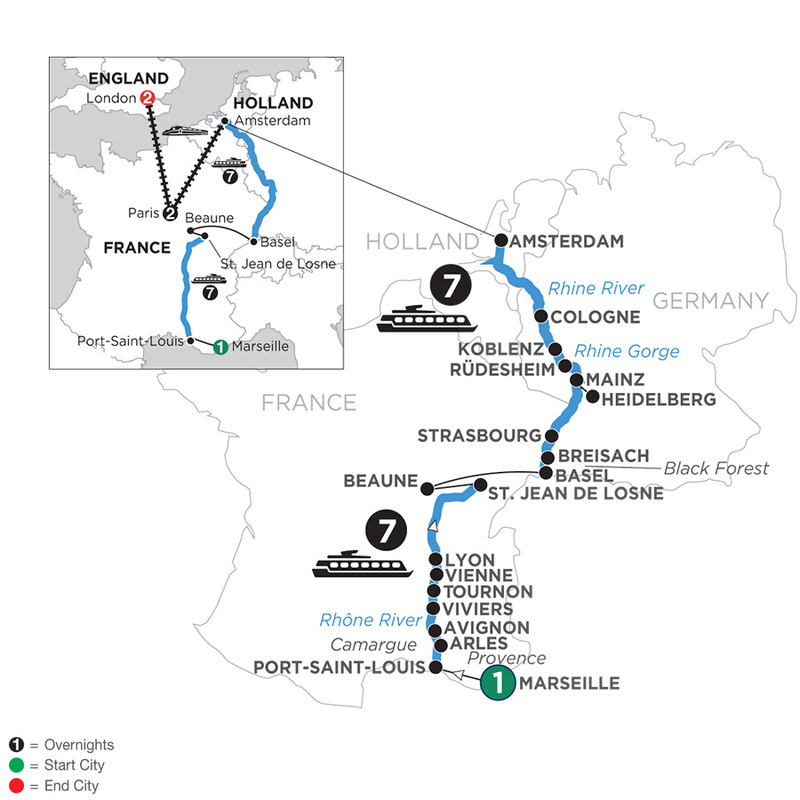 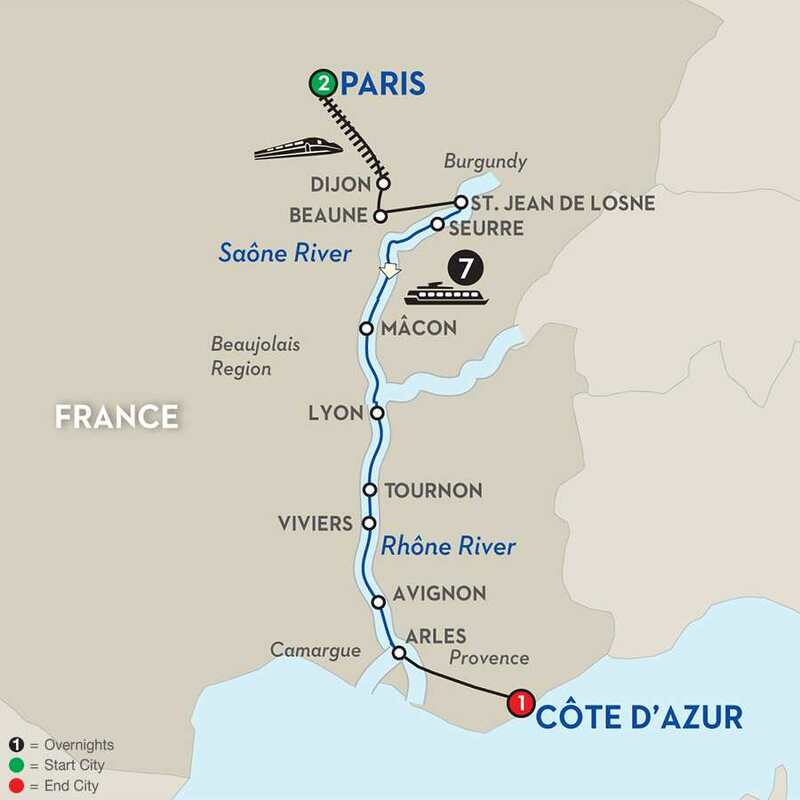 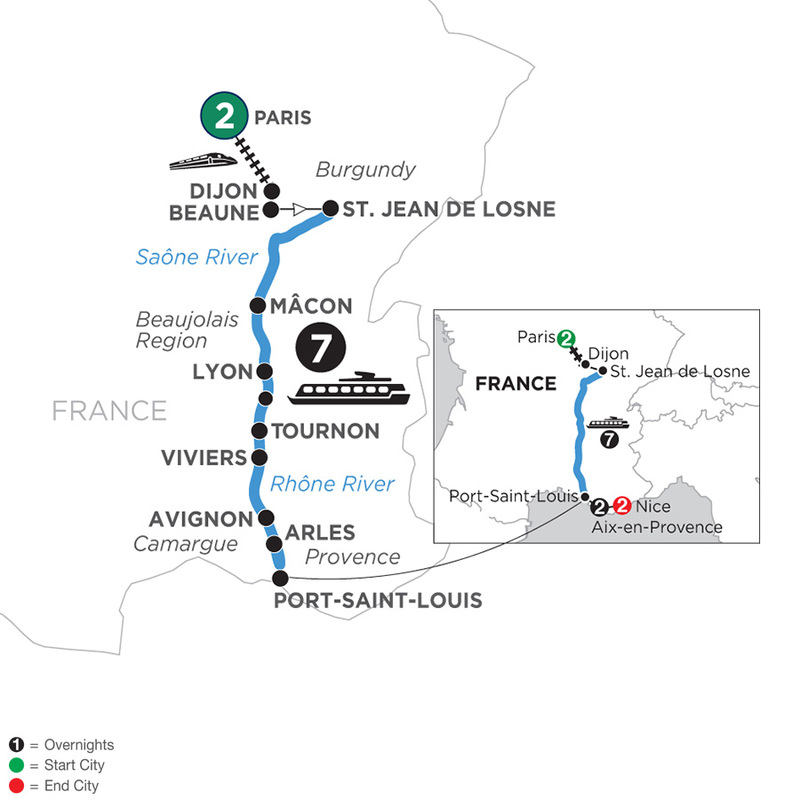 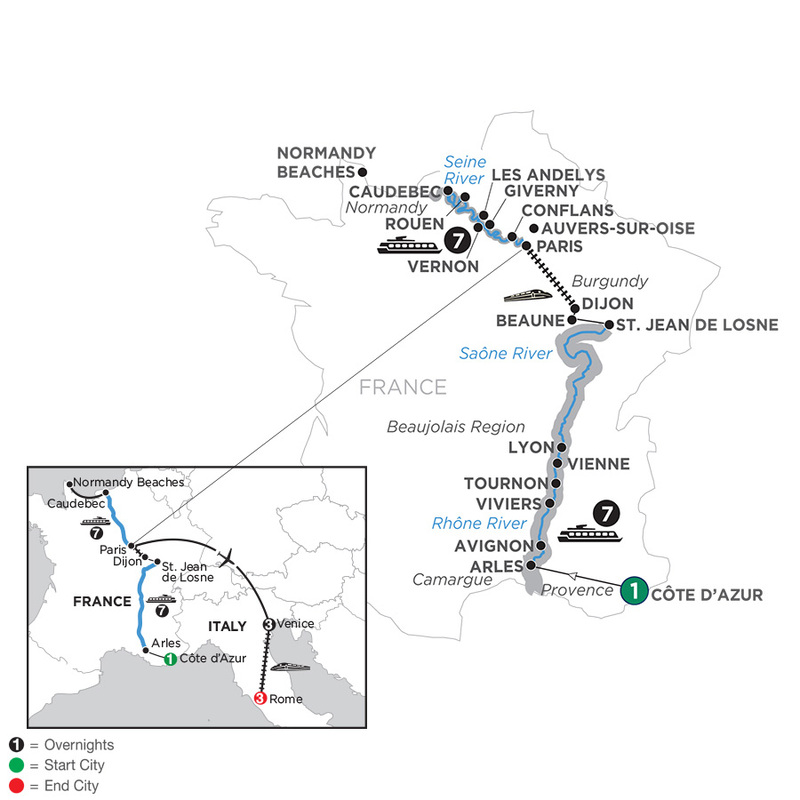 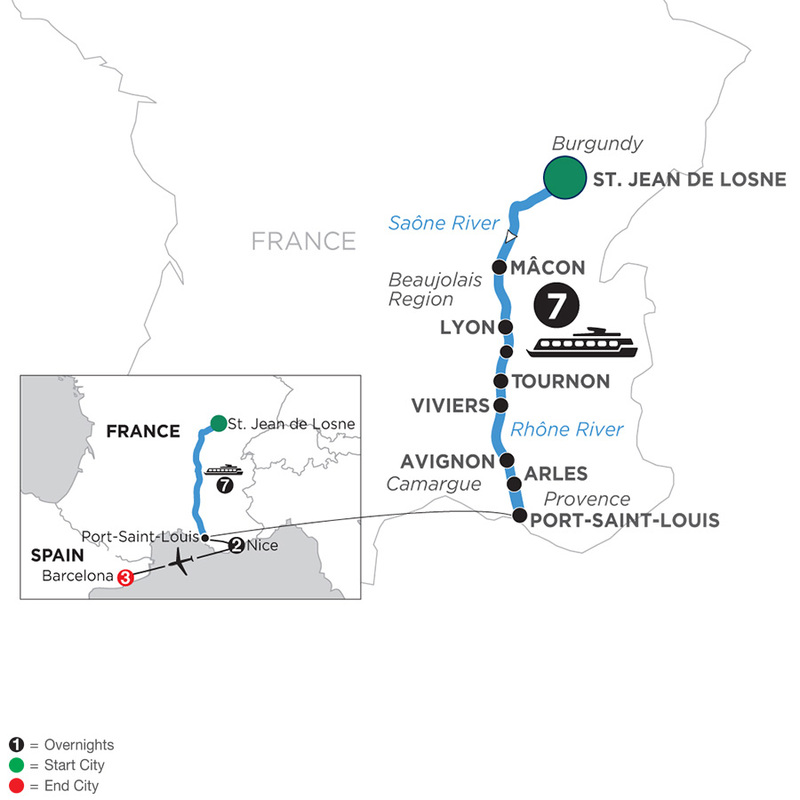 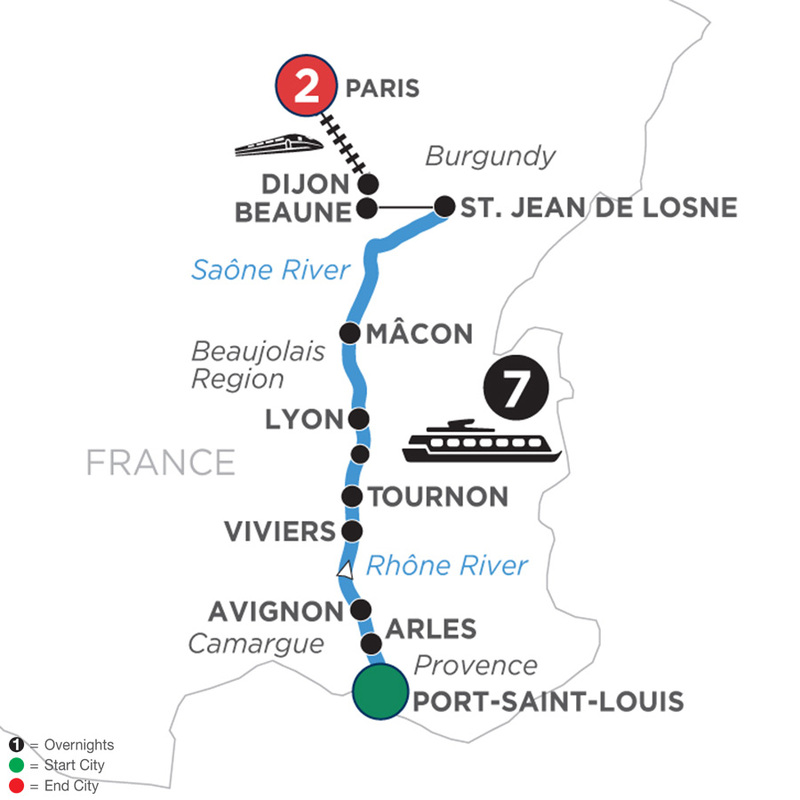 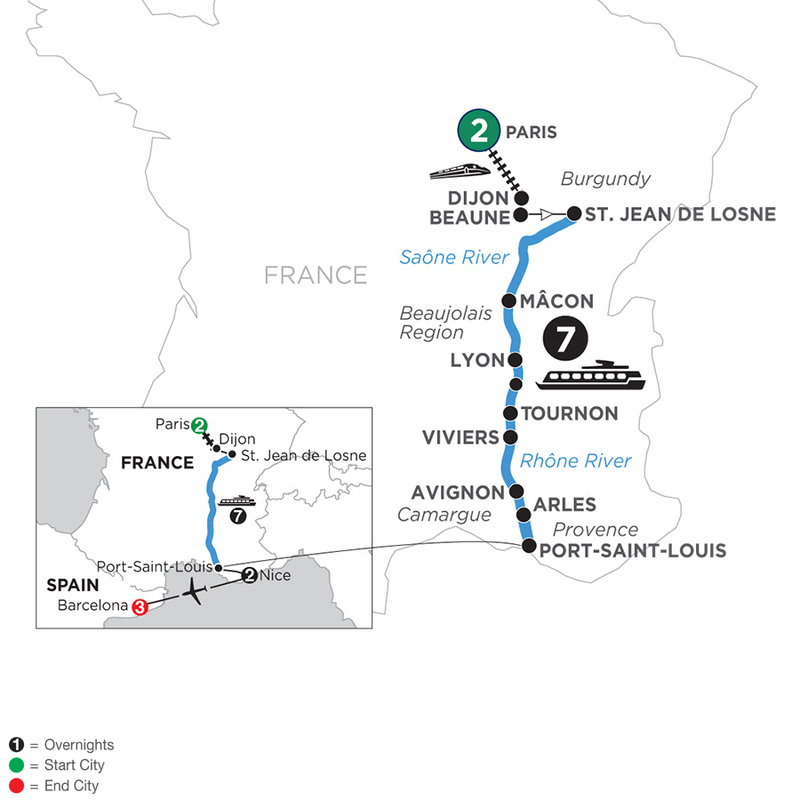 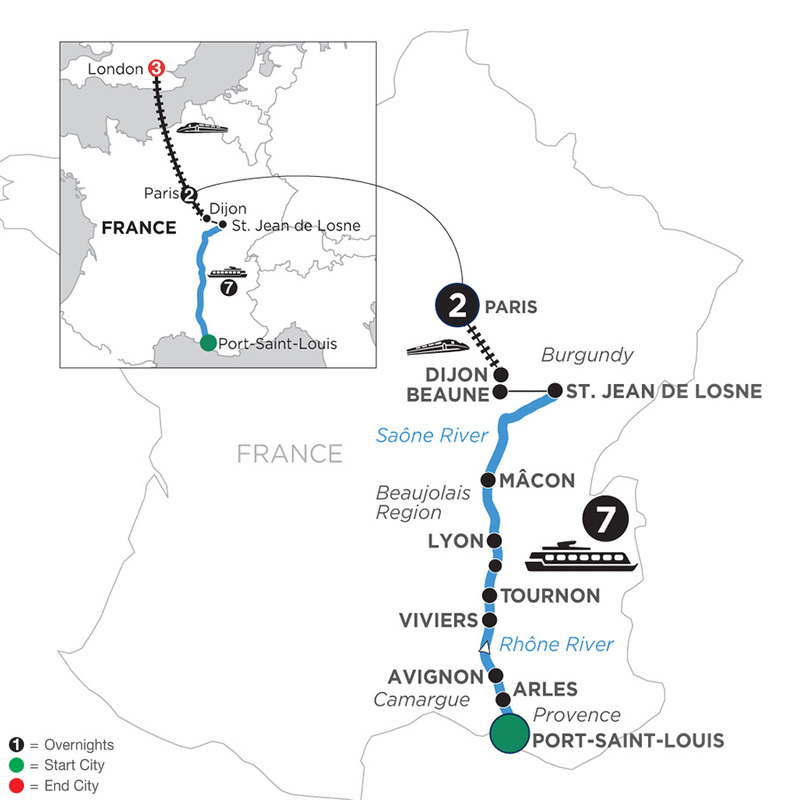 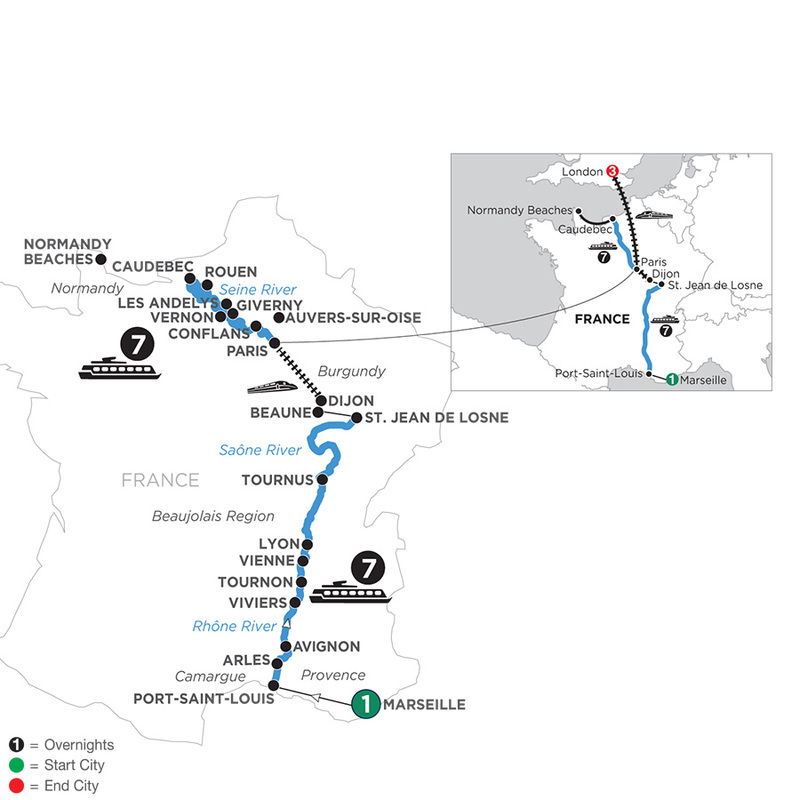 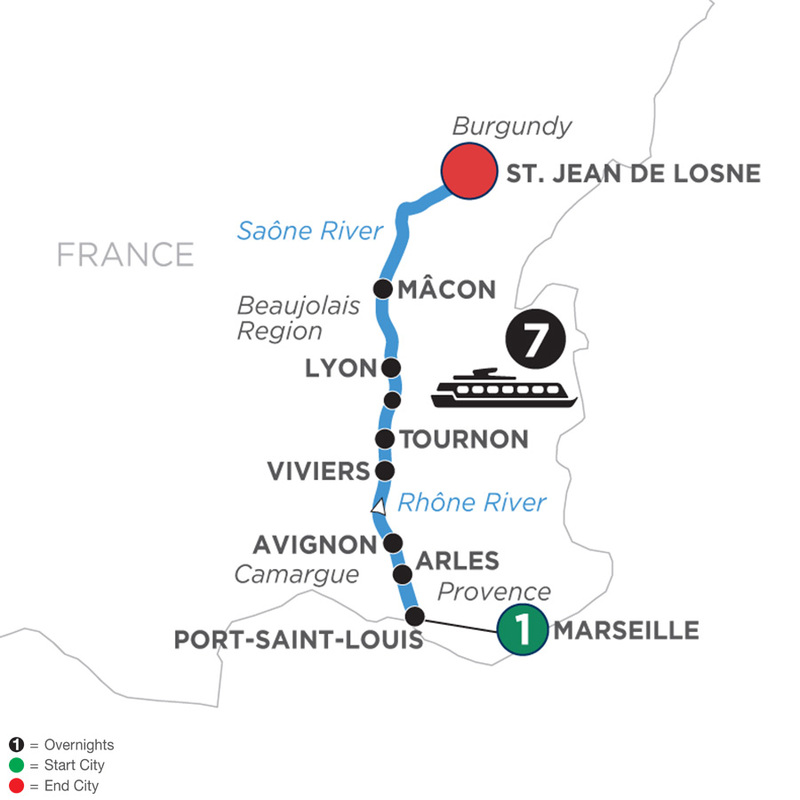 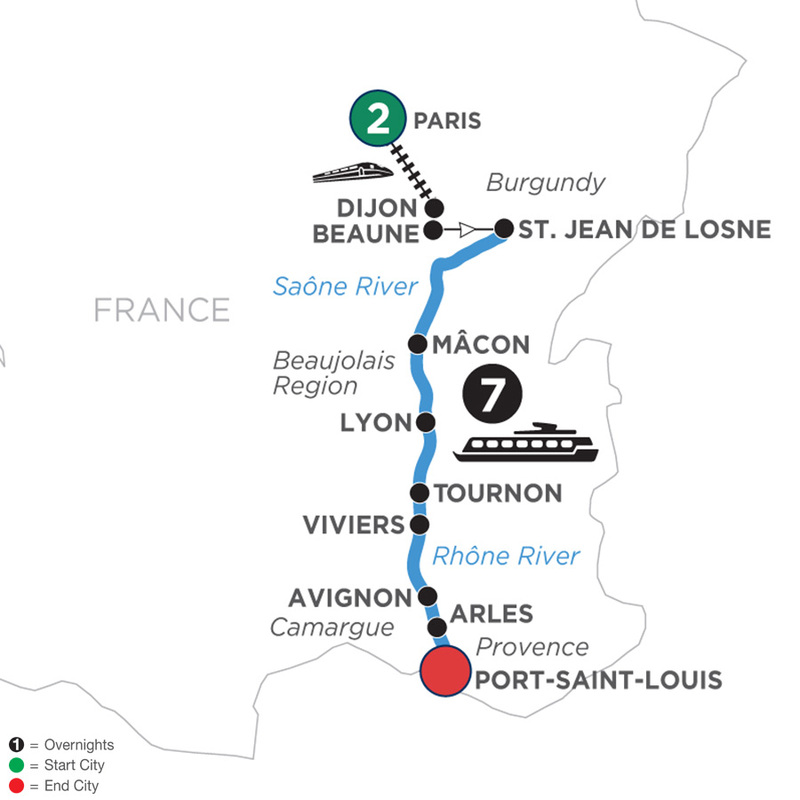 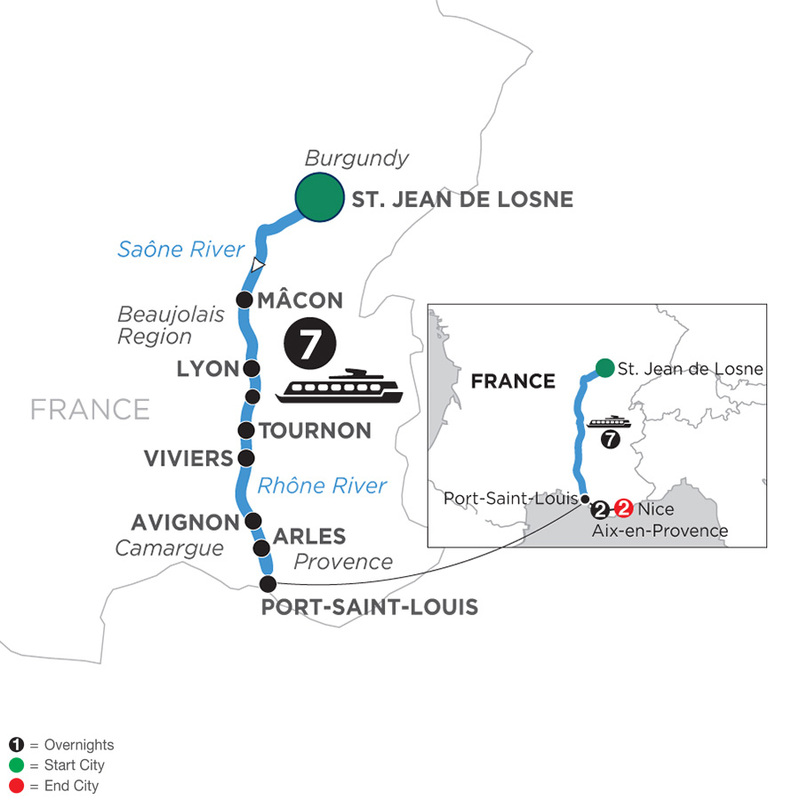 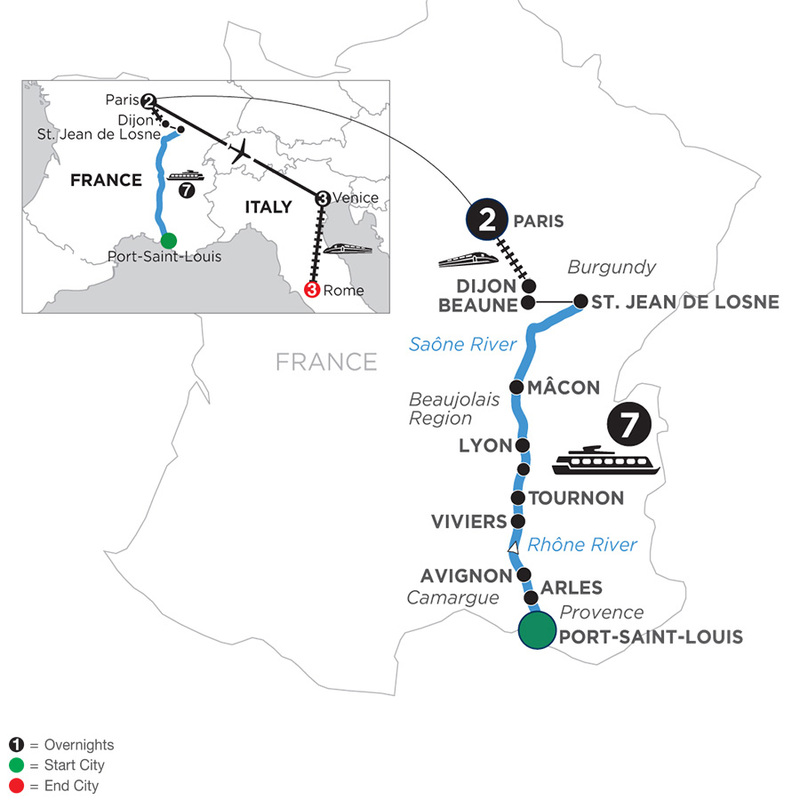 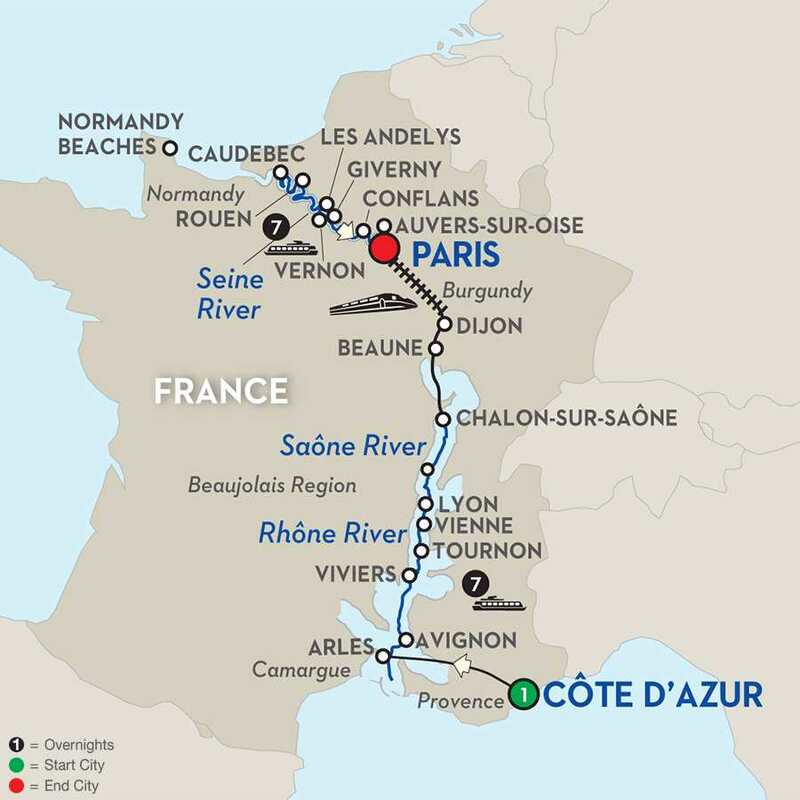 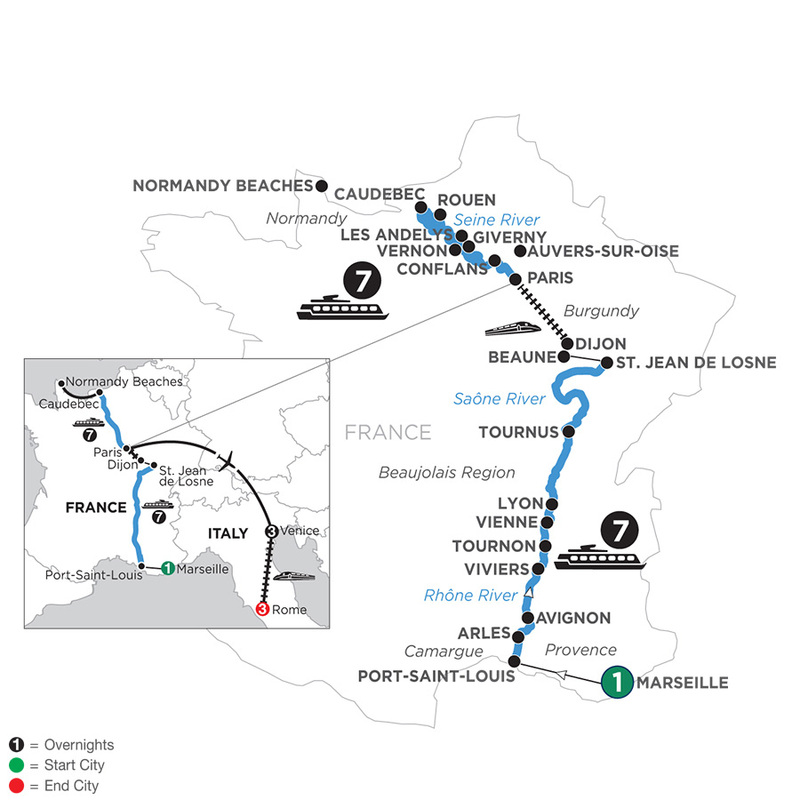 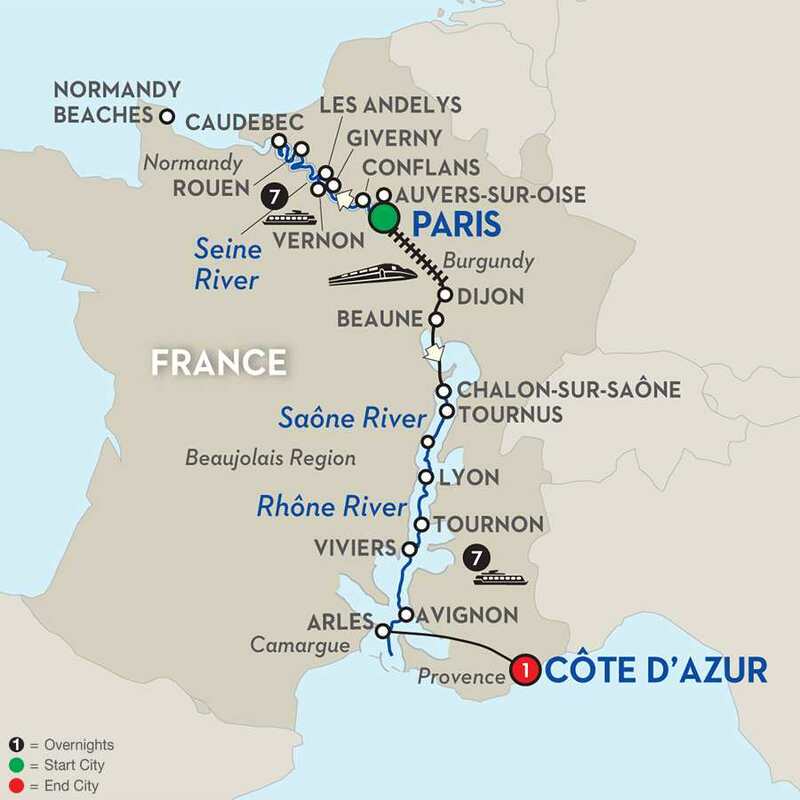 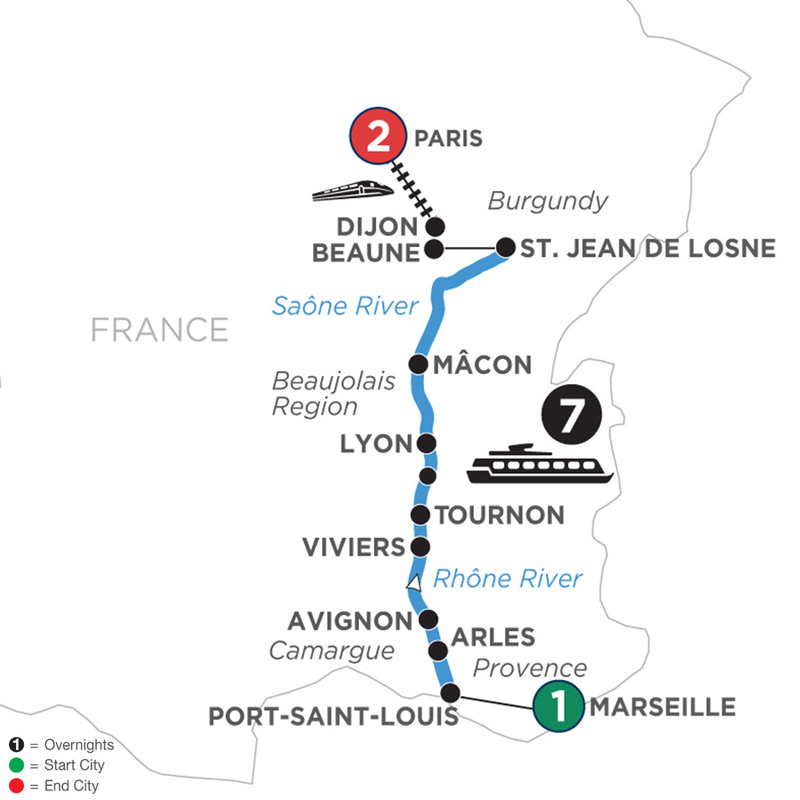 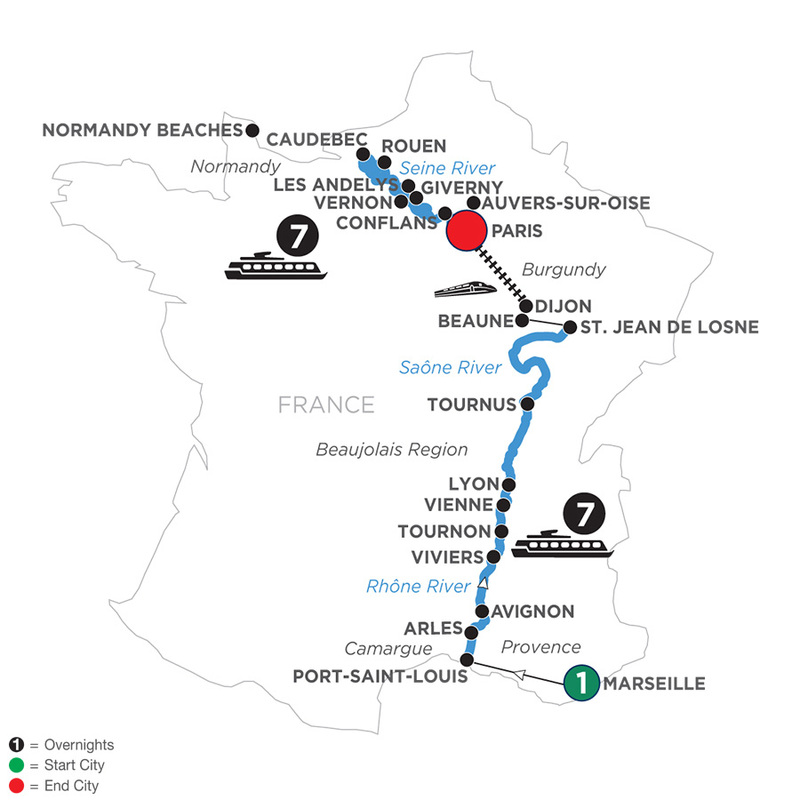 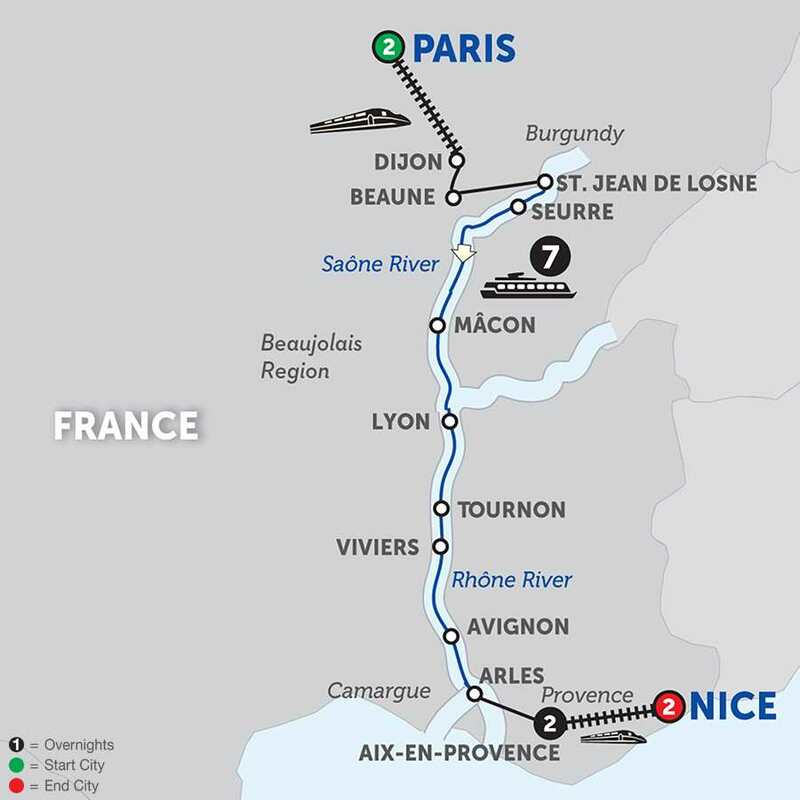 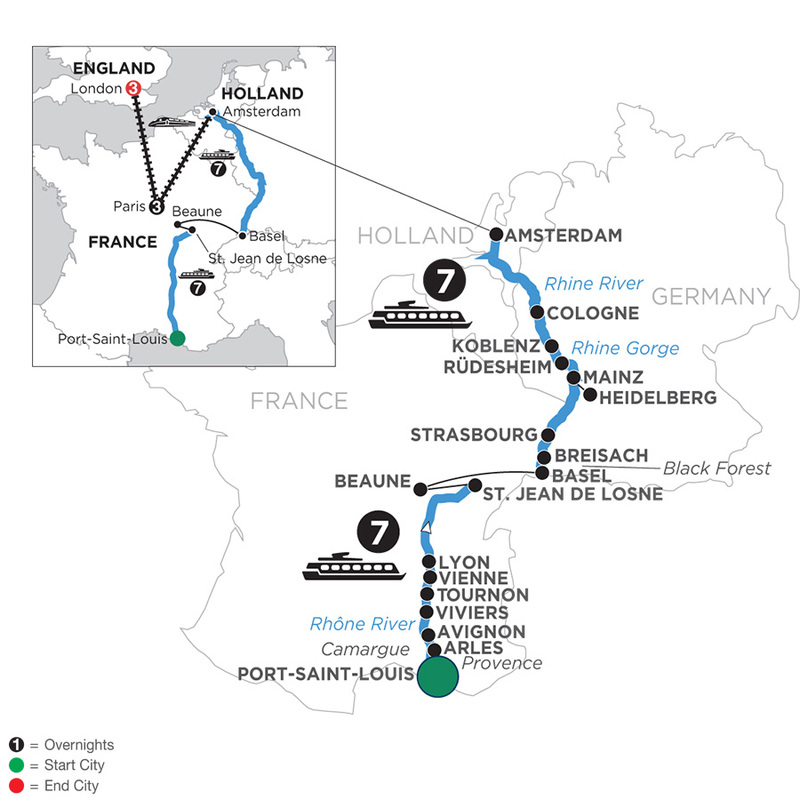 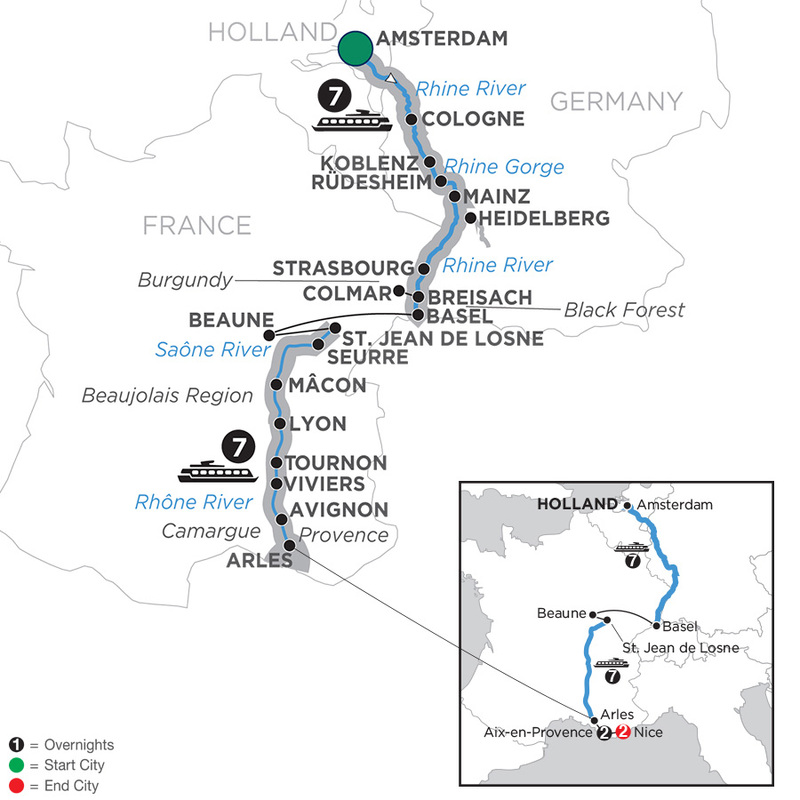 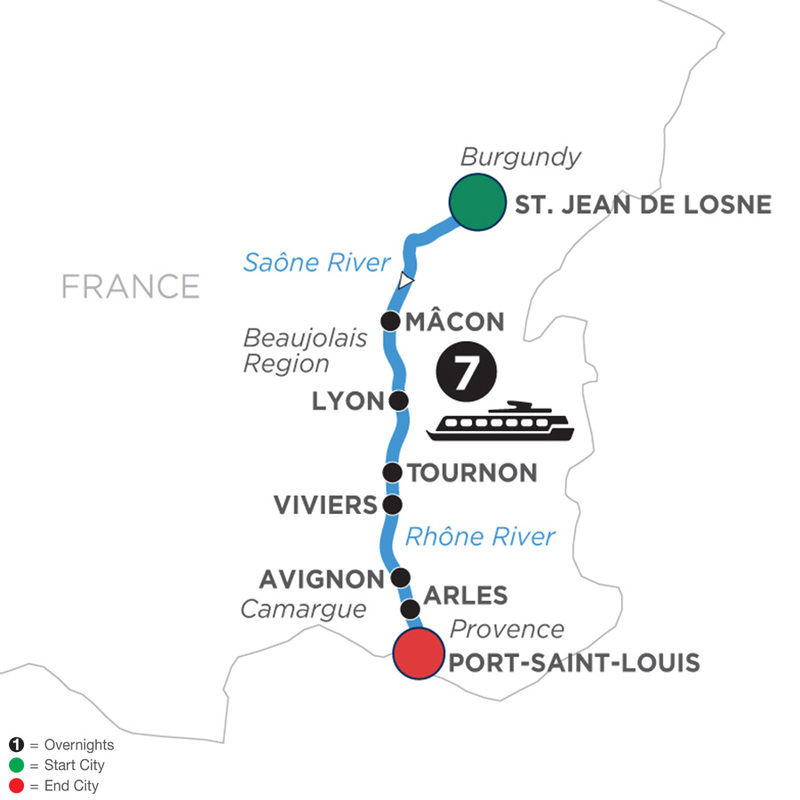 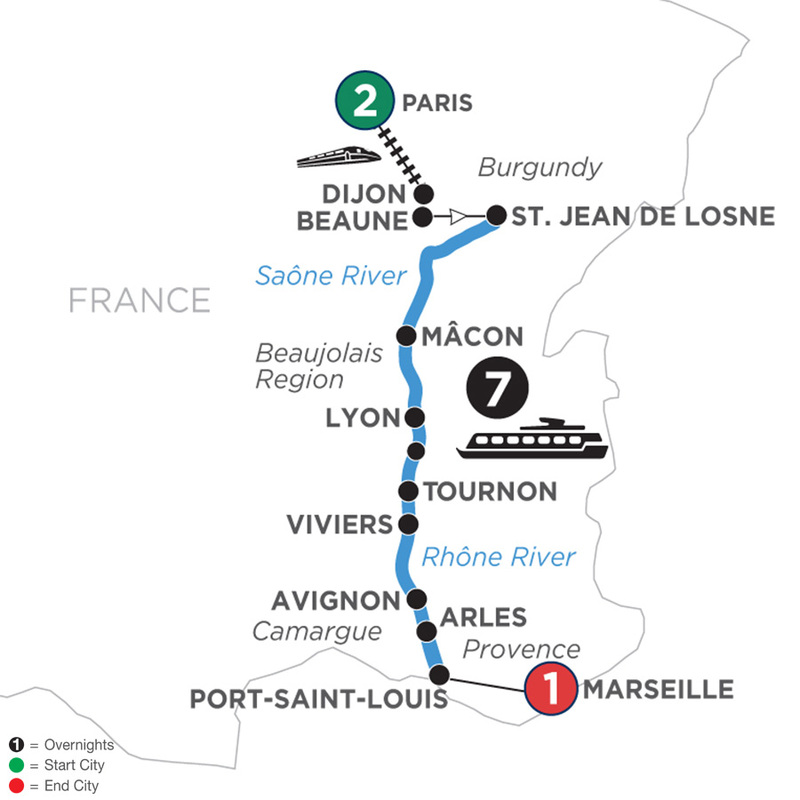 Enjoy wine, cheese, and stunning scenery on your France river cruise on the Seine and Rhône. 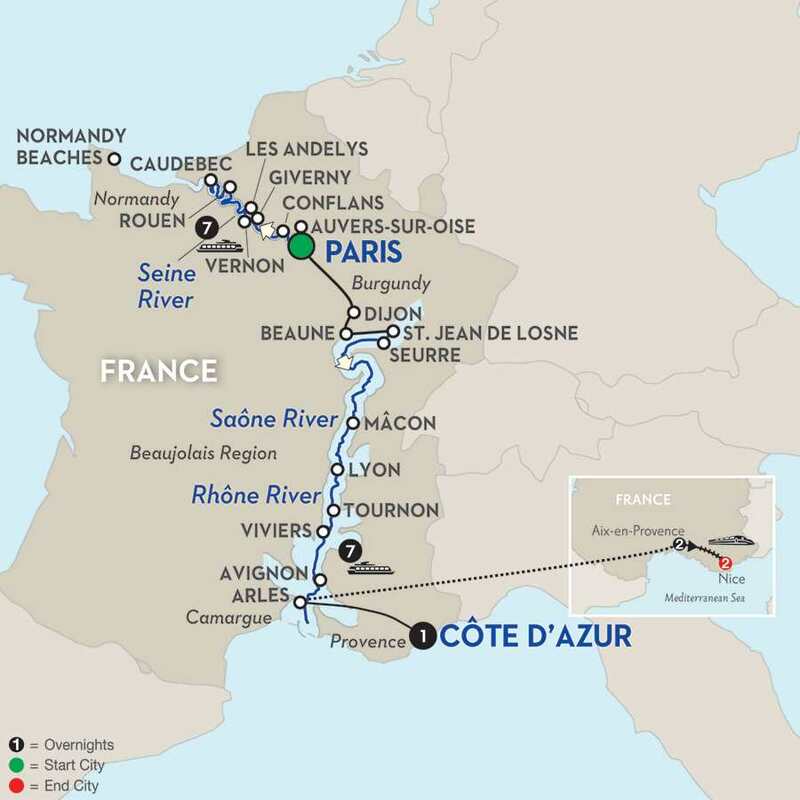 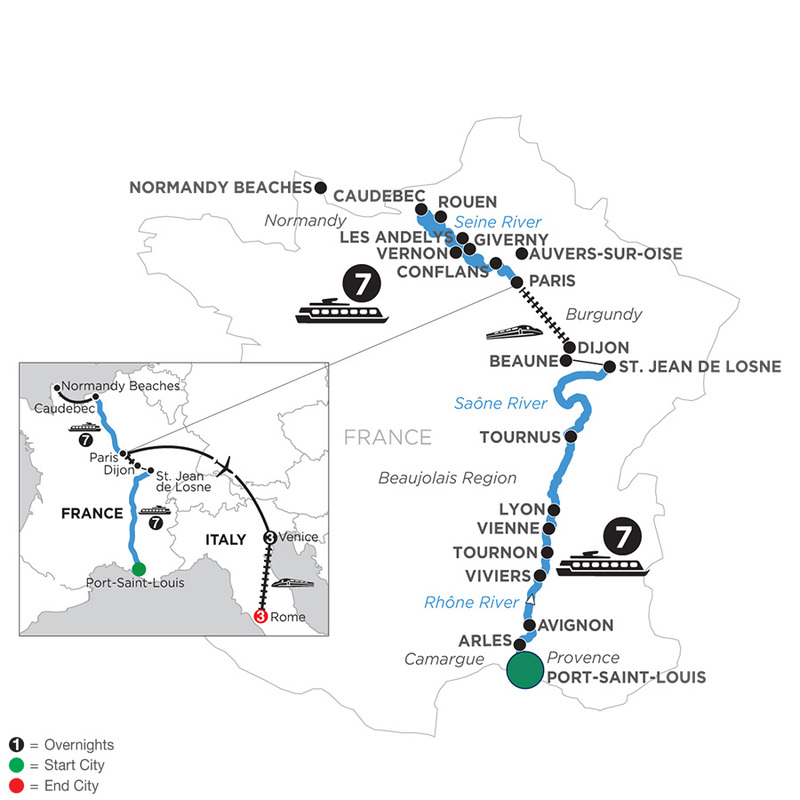 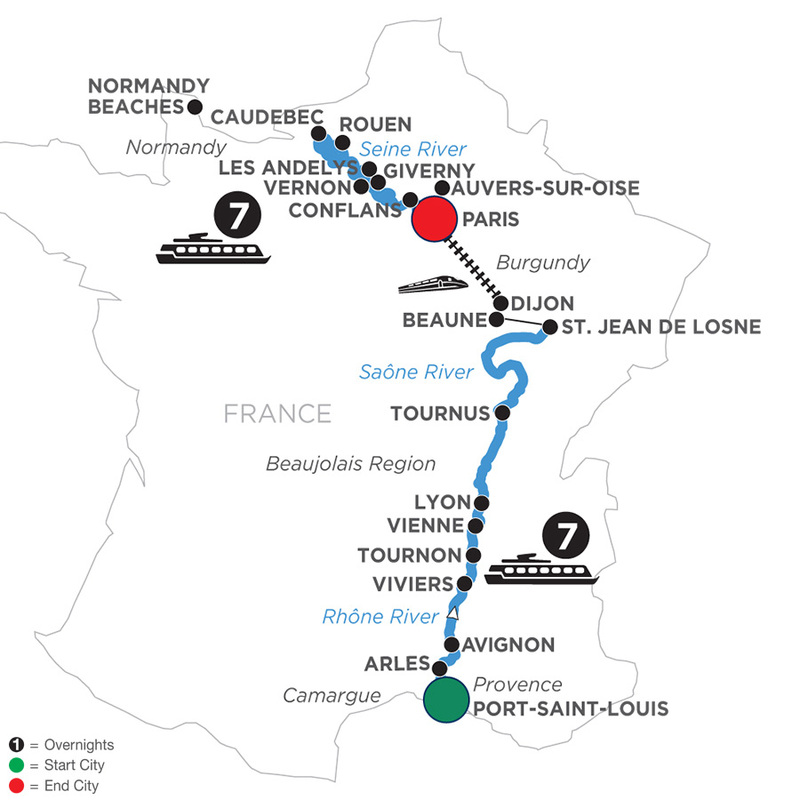 You’ll have a choice of historical excursions in Normandy, including the famed landing beaches, Point du Hoc monument, and the American Cemetery. 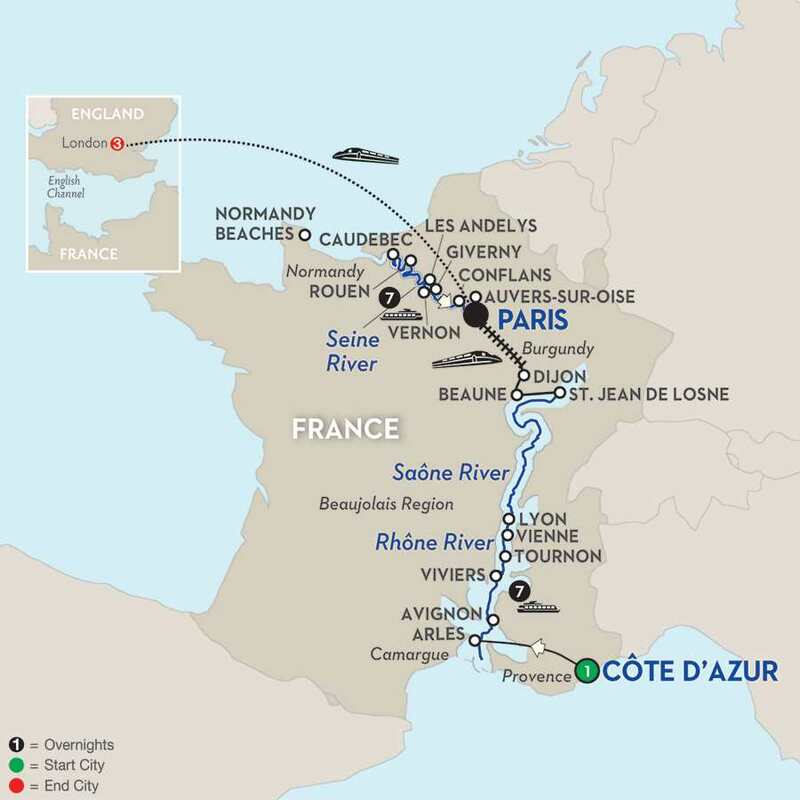 Visit Joan of Arc’s Rouen, and choose from Claude Monet’s Giverny or Bizy Castle; Vincent Van Gogh’s Auver-sur-Oise or Napoleon and Josephine’s Malmaison.